What's the name for normal life user experience? I'd like to know about how to call the design of experiences for real life. For example, the design of experiences for pedestrians has many disciplines like signage, psychology, architecture and so on. But is there a name to encompass all these disciplines for this case? The same could be said for the design of holistic experiences for a restaurant, or event, or medical processes (not the medical part itself, but everything related to it that is not medical per se). I'm more interested in architectural and interiors design, but anything related to improvement of life will work and is of the utmost interest for me. Terminology is not well defined. The problem is that the terminology in our field is loosely defined. The answer to your question might just be 'design'. The different design terminologies varies by the specific context and process that they're used for. There is a debate about the meaning of terms and not all academic authors and practitioners agree with each other on the definitions. Often times you can use several design terminologies for describing the same design process, and they can all will be valid. ISO 26800:2011 abstract presents the general ergonomics approach and specifies basic ergonomics principles and concepts. These are applicable to the design and evaluation of tasks, jobs, products, tools, equipment, systems, organizations, services, facilities and environments, in order to make them compatible with the characteristics, the needs and values, and the abilities and limitations of people. Video of Don Norman explaining what is User Experience. ISO 9241:210 Human-centred design is an approach to interactive systems development that aims to make systems usable and useful by focusing on the users, their needs and requirements, and by applying human factors/ergonomics, and usability knowledge and techniques. This approach enhances effectiveness and efficiency, improves human well-being, user satisfaction, accessibility and sustainability; and counteracts possible adverse effects of use on human health, safety and performance. Remember that the term system may not only mean a computer system or some other technological meaning, but can represent a system of processes supporting certain activity. For example for pedestrians have a system. It should have signage, lights, sidewalks, etc. This can be said that it is pedestrian system, just like the road system. Experience design (XD) is the practice of designing products, processes, services, events, omnichannel journeys, and environments with a focus placed on the quality of the user experience and culturally relevant solutions. An emerging discipline, experience design draws from many other disciplines including cognitive psychology and perceptual psychology, linguistics, cognitive science, architecture and environmental design, haptics, hazard analysis, product design, theatre, information design, information architecture, ethnography, brand strategy, interaction design, service design, storytelling, heuristics, technical communication, and design thinking. If you want an all-encompassing term, perhaps Universal Design?? Universal design - broad-spectrum ideas meant to produce buildings, products and environments that are inherently accessible to older people, people without disabilities, and people with disabilities. Universal Design (UD) is an approach to design that increases the potential for developing a better quality of life for a wide range of individuals. It is a design process that enables and empowers a diverse population by improving human performance, health and wellness, and social participation (Steinfeld and Maisel, 2012). It creates products, systems, and environments to be as usable as possible by as many people as possible regardless of age, ability or situation. Or maybe you mean something else entirely! UX designers are digital architects and we can all learn from each other. 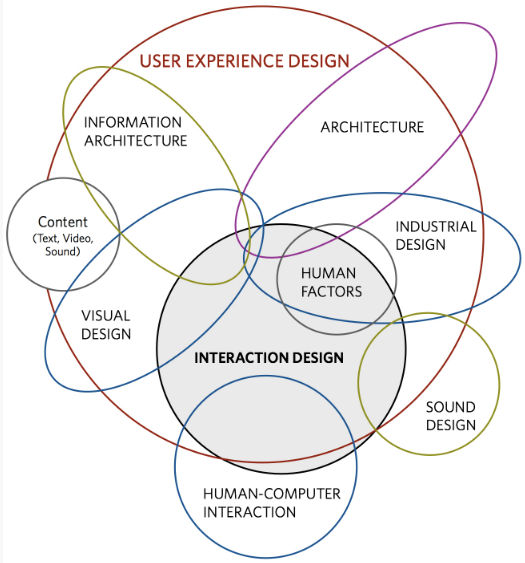 "User experience design," used in a broad sense, would cover the things you mentioned. People use signs, buildings, street lights, clerks, etc. to achieve their goals. Many of the examples you mentioned were public services, but I think the tools and methods employed by service design practitioners are probably what you're looking for. They mostly involve mapping the user's journey, and making sure that the people, places, and things a user encounters ("touch points") work together to create a positive experience. It's worth mentioning that if you're mostly interested in architecture or interior design, those are design disciplines in their own right and shouldn't be dismissed as not-experience-related. Practitioners of both disciplines spend a great deal of time designing spaces that are functional, safe, emotional engaging, etc. Not the answer you're looking for? Browse other questions tagged terminology ux-field or ask your own question. Is user experience a job position? What is the “horizontal user experience”? What is the relationship between customer experience and user experience? What's the common name for this button? Is “UX” as an abbreviation for “user experience” meant to be ironic? How can one design User Experience? What's the best way to name something that “belongs” to the user?